It was World Cerebral Palsy Day on (Oct. 7), and I’m wearing a green shirt to promote awareness – just as the movement suggested I do. I live with CP, but in no way is it the top priority in my life nor does it tell me what I can or cannot do. That’s why I was a little conflicted on how to approach this day of awareness. Do I celebrate (my wife even joked we could get a cake as an excuse to, well, eat cake)? Do I shout to the masses and try to educate others about CP (quite frankly, I’m not as educated about it as I should be; I just carry on with life)? Do I crinkle my brow in anger because for yet another day in the year, I’m singled out as being different from the rest of human life form (aren’t we all)? So, I read up on the day and had information sent to me and thought about it for some time and, well, decided to pull down the green shirt and fire off a tweet with the #WorldCPDay hashtag and retweet someone else who posted statistics about the world’s population living with CP and followed a Twitter account for the movement and liked pictures of things related to CP on Facebook. I embraced it. It’s me. CP is part of me … but just a part. I choose how I want to be defined – maybe not initially when I meet someone, but over time my identity shines through and CP is just a fragment of who I am. I’m devoted to my faith first. I’m a husband married to a fantastic and beautiful woman. I’m a father of two kids, with whom I play and laugh and sometimes have to discipline. I’m a friend and love to look at Facebook likes just to think about the different walks of life people are on and where they’re geographically located because some of them don’t even know each other. I’m a neighbor who’ll sit on the porch and talk, share a meal, take others’ kids to soccer practice, and appreciate it when they return the favor by snow-blowing my driveway. I’m a professor who teaches and conducts research. I’m a loyal fan of the Tennessee Volunteers, Atlanta Braves, and Peyton Manning. I have cerebral palsy and walk using forearm crutches. It’s just a brush stroke of the overall painting. This type of thought process doesn’t happen overnight, and it doesn’t have to be your thought process. We know that each disability is different, and within a specific disability those affects and challenges are different. And so is our response. What’s not different is that for those of us living with CP, it absolutely has shaped who we are to some degree. 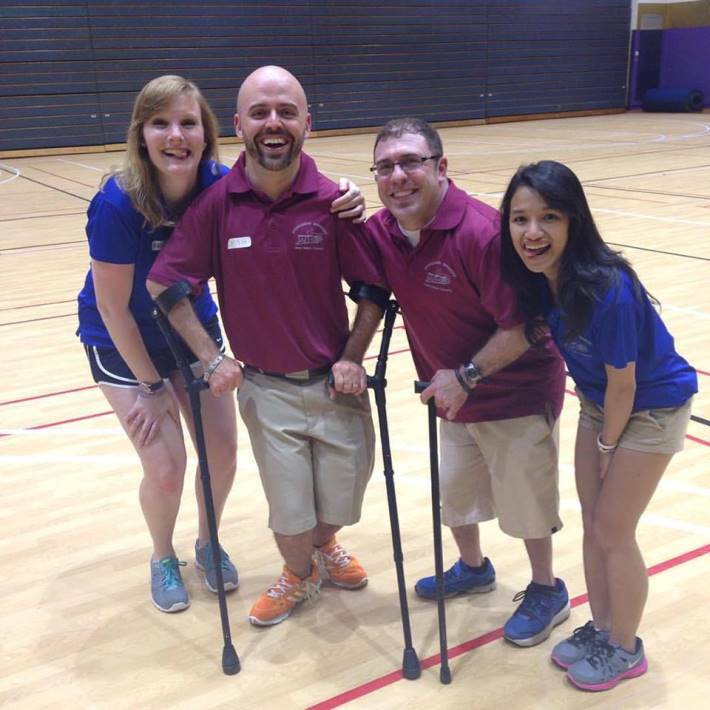 For some, it offers a platform to educate others about differences and abilities. That’s good. And that’s why I chose my green shirt to let others know CP is part of me but doesn’t define me. I love it when you say that “CP is part of who I am.” Disability needs to be view like a characteristic, someone with blue eyes, brown hair, and has CP. Your perspective very much touches this idea. Keep up the good work. Thanks, Bob! It’s just that – only a characteristic. Funny story: I used to speak to my son’s pre-K class and talk about differences and ask what was different about me. The first response was never about walking or crutches. It was that I have no hair! Again, only a characteristic.